Diamondbacks right-hander Taijuan Walker left his start against the Dodgers on Saturday with forearm tightness, Arizona announced. Walker departed after throwing two innings, during which he experienced a drop in velocity, per Nick Piecoro of the Arizona Republic. While the severity of Walker’s injury is not yet clear, forearm tightness often leads to more serious elbow troubles. The D-backs are left to hope this isn’t a major issue for Walker, who impressed with them last year – his first with the club – and has begun 2018 with 13 innings of 3.46 ERA pitching. Brewers outfielder Christian Yelich is eligible to come off the disabled list Sunday, but the club won’t activate him then, Adam McCalvy of MLB.com tweets. Yelich, who suffered an oblique injury last week, isn’t yet 100 percent, McCalvy notes. Meanwhile, fellow corner outfielder Ryan Braun left Saturday’s game against the Mets with back tightness, Adam Rosiak of the Milwaukee Journal Sentinel was among those to report. Whether it’s problematic enough to lead to a DL stint isn’t yet known. Braun, of course, missed 58 games last year while dealing with various injuries. Royals catcher Salvador Perez could make his 2018 debut during the team’s next homestand, which runs from April 24-29, Jeffrey Flanagan of MLB.com writes. Perez, who suffered a Grade 2 MCL tear in his left knee on March 28, began a rehab assignment at the Double-A level on Saturday. The Perez-less Royals have gotten terrible offensive production early this year from behind-the-plate fill-ins Drew Butera and Cam Gallagher, who combined for a .175/.227/.250 line entering Saturday. Thanks in part to their struggles, Kansas City’s a woeful 3-10. Rangers center fielder Delino DeShields could come back earlier than expected from the broken left hamate bone he suffered March 31, Evan Grant of the Dallas Morning News relays. DeShields was slated to miss four to six weeks at the time of the injury, but he’s aiming for an April 23 return – which would be three weeks. The Rangers’ reserve options, Drew Robinson and Carlos Tocci, haven’t exactly stepped up during DeShields’ absence. Robinson has hit a meek .167/.255/.262 in 47 plate appearances, while Tocci has collected only one hit in 10 trips to the plate. After letting him sit out a few games with a minor oblique injury, the Brewers have elected to place outfielder Christian Yelich on the 10-day DL. In a corresponding move, the team has recalled right-hander Taylor Williams from Triple-A Colorado Springs. During Yelich’s absence, it seems likely that Domingo Santana will fill in for him in the outfield. Yelich was off to a hot start for the 2018 season; he’s hit .385/.407/.577 across 27 plate appearances for the Brew Crew with one long ball and five runs driven in. The 26-year-old has played at least 155 games in consecutive seasons, a streak that will now officially come to an end with the news that he’ll miss at least the ten-day minimum. Yelich, of course, was perhaps the Brewers’ biggest offseason addition. The club sent top prospects Lewis Brinson and Isan Diaz, along with two other minor-leaguers, to Miami in order to bring the young slugger to Milwaukee. He sports a career .291/.366/.433 batting line across his first 2,839 plate appearances, with 60 homers and a 121 wRC+. Three prominent players have reportedly agreed to terms in recent days, all settling for much less in dollars and years than had been expected. Reports also suggest that those players could have had greater earnings had they taken offers available previously. Though agent Scott Boras says Mike Moustakas never received a multi-year contract offer before returning to the Royals, two sources tell Sam Mellinger of the Kansas City Star that the Angels dangled a three-year pact in the range of $45MM. Meanwhile, the Rockies are said to have offered slugger Carlos Gonzalez an extension in the realm of three years and $45MM this time last year, Bob Nightengale of USA Today reports on Twitter. And the Rox also were willing to go to three years, at a $21MM guarantee, to catcher Jonathan Lucroy earlier this winter, Nightengale adds on Twitter. (Lucroy is reportedly in agreement on a one-year deal with the Athletics, though terms are not yet known and the deal is not finalized.) Of course, in each case it’s easy to understand why the player in question might have elected against jumping at the reported opportunity at the point at which it was presented. In other news that’s largely of historical interest, Jon Heyman of Fan Rag provided some notes on the Padres’ offseason efforts. The team was able to land Eric Hosmer after Kansas City was unable to earn ownership authorization for its initially reported, seven-year offer, Heyman reports. That seemingly helps explain why subsequent reports indicated that K.C. never went that high in the bidding. San Diego also “made a big play” for outfielder Christian Yelich before he was shipped from the Marlins to the Brewers, Heyman notes in his leaguewide rundown of information. Notably, the Pads effectively ended up adding an outfielder when they inked Hosmer, thus pushing Wil Myers back onto the grass. Some of the above information suggests, to an extent, that some players missed chances at bigger earnings, though perhaps it might only mean that others would have ended up enduring rough trips through free agency. And the reported offers are hardly overwhelming numbers for those players. Those interested in the broader subject of labor relations will certainly want to read this recent piece from Evan Drellich of NBC Sports Boston, who takes a long look at what the union could do to begin fighting back against some of the problems that have arisen from the players’ perspective under the current CBA. Meanwhile, J.J. Cooper of Baseball America also tackles the subject, arguing that the owners will need to be careful not to press their advantage too strongly. And union chief Tony Clark discussed some of the qualms with the Marlins, who are one of the teams facing a grievance from the MLBPA, as Clark Spencer of the Miami Herald reports. It was no secret that Christian Yelich wasn’t happy with the Marlins’ latest fire sale, and the team felt that Yelich could’ve become a clubhouse distraction had he remained on the roster, Barry Jackson of the Miami Herald reports. This is why trading Yelich was more of a priority than dealing catcher J.T. Realmuto, as “the Marlins believe Realmuto will be a good soldier if he isn’t traded.” Of course, Realmuto has reportedly asked for a trade as well, though Miami is reportedly holding out only for a big return if the catcher is to be moved. Jackson also notes that first baseman Justin Bour (a popular target for teams calling the Marlins) hasn’t asked for a trade. “If I had the opportunity to pick a position, I would pick second base,” Asdrubal Cabrera tells Kevin Kernan of the New York Post. This represents a change in attitude from during the season, when Cabrera was openly unhappy about moving from shortstop to the keystone, though Cabrera explained to Kernan that his displeasure over the position change stemmed from the move seemingly being sprung upon him with little notice. “I was not happy with the communication,” Cabrera said. The veteran infielder also noted that he likes playing third base, which looks to be his primary position for 2018 as things currently stand on the Mets’ roster. New York has been primarily linked to second basemen in trade and free agent rumors, though Cabrera’s flexibility (and that of the re-signed Jose Reyes) make it possible that the Mets could still make a play for a third baseman. The Phillies have been unable to find a trade partner for Tommy Joseph this offseason, leaving the first baseman fighting for a roster spot as Spring Training approaches, The Athletic’s Matt Gelb writes (subscription required and recommended). Rhys Hoskins’ presence led the Phils to shop Joseph last summer, and the path to first base playing time has become even more blocked now that Carlos Santana is a Phillie. “You don’t know where you fit in,” Joseph said. “You don’t know what your role is. But those are all things that will evolve as spring training gets started and as we get deeper into March….I’ll go out there and earn my keep.” As Gelb notes, the Phillies’ trade efforts have been hampered by the presence of so many other first base options still available in free agency. Joseph still has a minor league option remaining, so he could find himself back in Triple-A after hitting 43 homers and a .247/.297/.460 slash line over his first 880 MLB plate appearances. The Braves plan to have a spirited Spring Training competition for rotation jobs, as manager Brian Snitker tells Gabriel Burns of the Atlanta Journal-Constitution that as many as three starting spots could be up for grabs. Julio Teheran and Mike Foltynewicz have two slots spoken for, and the newly-acquired Brandon McCarthy will be a strong favorite for the third slot if healthy. That leaves the likes of Max Fried, Luiz Gohara, Lucas Sims, Sean Newcomb, and Mike Soroka battling for the remaining rotation spots, plus Scott Kazmir could also be a factor if he can recover from the injuries that sidelined him for all of the 2017 season. Atlanta is more likely to use the starters that don’t win jobs as relievers rather than again use a six-man rotation, Snitker said. The Blue Jays were “the only other team that came close” to acquiring Christian Yelich from the Marlins before the outfielder was dealt to the Brewers, SiriusXM’s Craig Mish reports (Twitter links). “Several variations” of trade packages were discussed between the Jays and Marlins, including some deals that would’ve seen Toronto take some extra money off Miami’s payroll. What ended talks between the two sides was the Jays’ refusal to deal Vladimir Guerrero Jr. It was no secret that the Marlins were demanding a big return for Yelich, and it also isn’t surprising that the Jays balked at moving Guerrero, one of baseball’s very best prospects. Despite “a significant reduction in the gap between” the arbitration numbers filed by the Orioles and Jonathan Schoop, “the level of frustration on both sides is growing” as a deal still isn’t close, MASNsports.com’s Roch Kubatko writes. In what could be a related story, Schoop didn’t attend the Orioles’ FanFest this weekend, which left manager Buck Showalter “disappointed,” implying that Schoop’s agent advised the second baseman to skip the event (as per Eduardo A. Encina of the Baltimore Sun and other reporters). Schoop filed for a $9MM salary while the Orioles filed at $7.5MM. Kevin Gausman’s arbitration case has also yet to be settled, though Kubatko hears that the O’s will continue to talk to both Gausman and Schoop in the hopes of avoiding a hearing. The Yankees have roughly $10-$15MM ticketed to spend on a starting pitcher or an infielder who can play second base and/or third base, Joel Sherman of the New York Post writes. If everything breaks right for the Yankees in regards to the slow free agent market, they could fill both needs with those funds. With the club intent on staying under the $197MM luxury tax threshold, that $10-$15MM will leave the Yankees with around $15-20MM on other potential expenses (i.e. contract bonuses, in-season callups or midseason trade acquisitions). Adding a second baseman would provide depth if Gleyber Torres needs more minor league time as he recovers from Tommy John surgery, and Sherman notes that delaying Torres’ debut would help the Yankees gain an extra year of team control over the star infield prospect. With Lorenzo Cain landing a five-year commitment from the Brewers, the Boston Herald’s Michael Silverman believes that the Red Sox may be forced to offer J.D. Martinez more than the five-year deal they reportedly have on the table for the free agent outfielder. Martinez is two years younger than Cain and can be signed without draft pick compensation, which could go towards enhancing Scott Boras’ argument that Martinez should receive at least a six-year deal. Baltimore Orioles Boston Red Sox Christian Yelich Jonathan Schoop Kevin Gausman Miami Marlins New York Yankees Toronto Blue Jays Vladimir Guerrero Jr. The Indians felt they had a shot at signing Lorenzo Cain to a three-year deal, Paul Hoynes of the Cleveland Plain Dealer writes, though they still would have needed to trade another notable contract off the roster to accommodate a Cain signing. Management felt a pursuit of Cain was a risk worth taking, as the Tribe is very familiar with the center fielder’s abilities from his years as a division rival. Cleveland was able to land Edwin Encarnacion on a smaller-than-expected three-year deal last winter due to a slow market, though while Cain’s market also took a while to develop, he still had multiple four-year offers on the table (and eventually landed five years from the Brewers). It isn’t clear if the Tribe is still looking to make a notable outfield addition if they can clear payroll, or if the team was only willing to make such a big splash for Cain specifically. With Alcides Escobar on the verge of re-signing with the Royals, GM Dayton Moore still sees Raul Mondesi Jr. as a notable piece of the team’s future, Moore told reporters (including Maria Torres and Pete Grathoff of the Kansas City Star). Mondesi had been expected to take on a larger role as the everyday shortstop this season, though the additions of Escobar and Ryan Goins as shortstop depth could see Mondesi spend time at other positions. “[Mondesi] can play second base, he can play short, he’s good enough to play center field. We’ll see how that emerges,” Moore said. “We don’t have a clear vision of that right now, other than to simply say that he is a talent that we expect to develop.” It still seems as though K.C. plans to see quite a lot of Mondesi this season, as Moore said that Mondesi’s development is best helped by appearing in “five of six, five of seven” games per week. On the flip side, Fangraphs’ Eric Longenhagen wonders if the Royals may have moved on from Mondesi and are now looking at prospect Nicky Lopez as their shortstop of the future. Some scouts and executives from around the league are troubled by Mondesi’s bat control and lack of plate discipline, as well as concerns about his off-the-field preparation and focus issues. Longenhagen feels that teams with an interest in Mondesi’s potential should be calling the Royals in case Kansas City would be open to trading the shortstop. The White Sox will be ready and willing to spend when they move from rebuilders to contenders, GM Rick Hahn told CBS Chicago’s Bruce Levine and other reporters. “Ultimately, competing for free agents and targeting big-ticket items and hopefully converting on them will be the next logical step when the time is right,” Hahn said. “Anyone who doubts that we will break from past perception or past process, I believe the evidence is there over the last year that those old standards are gone.” Chicago has explored making some high-profile (and pricey) trades for the likes of Manny Machado and Christian Yelich this winter, and in my opinion, it wouldn’t be a total surprise to see the Sox make a play for one of the big-name free agents still on the market. Speaking of Yelich, Hahn said (via Levine’s Twitter) that the White Sox “we were not comfortable going above what we offered” the Marlins in negotiations. Alex Wilson will stretch out as a starter in the Tigers’ spring camp, the right-hander tells Chris McCosky of the Detroit News. Just one of Wilson’s 231 MLB appearances has come as a starting pitcher, and even that was a three-inning emergency outing in 2015. Still, Wilson has been a durable multi-inning reliever and feels a transition is possible. As McCosky notes, it’s essentially “a no-risk experiment” for the Tigers since Wilson can always return to his previous bullpen role if the rotation move doesn’t pan out. Wilson posted a 2.47 ERA over 171 1/3 IP from 2014-16, though an inflated homer rate boosted his ERA to 4.50 over 60 frames last season. The righty also said that he is fully recovered from a broken right leg suffered last September. The Brewers have announced a blockbuster deal to acquire outfielder Christian Yelich from the Marlins. Outfielders Lewis Brinson and Monte Harrison, infielder Isan Diaz, and righty Jordan Yamamoto make up the return for Miami. Milwaukee entered the winter with numerous quality young outfield options. Indeed, speculation has centered on the possibility that the organization would deal from its surplus, making this move all the more surprising. On the other hand, the Brewers were relatively unsettled in center field — where Yelich would presumably line up as things stand at present — and were reported recently to have made an offer for the quality young outfielder. The Brew Crew ended up improving an area of strength by sending out two prospects originally acquired via trade (in their recent round of veteran-paring swaps) along with a pair of 2014 draft picks. What’s most interesting about this swap, perhaps, is that it could set Milwaukee up for yet further moves, perhaps helping to facilitate a move to deepen the organization’s rotation. The organization could still deal other outfielders if it so chooses after parting with Brinson to add Yelich. Keon Broxton and Brett Phillips are among the other players on hand that could be dangled. Interestingly, per Rosenthal (via Twitter), the club will not give up its pursuit of top center fielder Lorenzo Cain despite today’s move; in that scenario, presumably, Domingo Santana could even be dealt. Given that the Brewers also won’t be taking on much in the way of near-term salary in adding Yelich, the team could also still set out onto the open market to find a starter. Yelich, who only recently turn 26, is guaranteed a manageable $43.25MM over the next four seasons, with a $15MM club option (or $1.25MM buyout) for the 2022 campaign. That’s a bargain rate for a player who has steadily produced at an above-average rate in all areas of the game ever since he cracked the majors in 2013. In three of the past four seasons, Yelich has racked up exactly 4.5 fWAR. He has done that in different ways, too. Yelich has always hit at an above-average rate, but only once — 2016, when he posted a 132 wRC+ — turned in a truly superlative season at the plate. In 2017, he slashed a productive but hardly world-beating .282/.369/.439 with 18 home runs, but added greater value on the basepaths (a 6.8 BsR grade that ranked sixth in all of baseball). And it was top-notch corner outfield defense that was most noteworthy about Yelich’s performance in 2014. 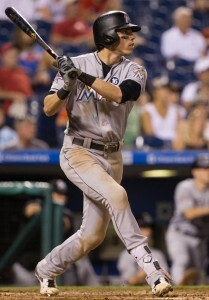 Perhaps, then, there’s reason still to hope that Yelich can produce even more than he already has in a given campaign. Some also have suggested that his power could still develop, particularly if he spends more time away from Marlins Park. There are a few areas of concern — for instance, Yelich owns a mediocre career .272/.331/.373 batting line against lefties and graded poorly (-6) in center field last year in the view of Defensive Runs Saved. On the whole, though, he’s clearly one of the better young outfielders in baseball. The price paid reflects the asset acquired here for the Brewers. By consensus, Brinson was the team’s best prospect. Though hardly considered a sure thing, the soon-to-be 24-year-old outfielder — acquired from the Rangers in the Jonathan Lucroy swap — is widely considered one of the 25 or so best pre-MLB assets in baseball. Last year, he slashed a robust .331/.400/.562 with 13 home runs and 11 steals in 340 plate appearances at Triple-A. He’s also considered a top-quality up-the-middle defender. Having briefly touched the bigs for the first time in 2017, Brinson will likely enter camp as the odds-on favorite to start in center for the new-look Marlins. There’s depth in this prospect package, too. Harrison is likely the second-best asset heading to Miami. He hit on both ends of a promotion from Class A to High-A in 2017, compiling a .272/.350/.481 batting line on the year. Diaz, also a ’14 second-rounder, came to Milwaukee in the Jean Segura trade. He cracked top-100 prospect lists last winter. He ended up scuffling in his first attempt at High-A — .222/.334/.376 with 13 home runs but also 121 strikeouts in 455 plate appearances — but is just 21 and still viewed as a high-quality middle infield prospect. Yamamoto is also a 21-year-old who played last year at High-A. He had an emergent campaign, compiling a 2.51 ERA with 9.2 K/9 against 2.4 BB/9 over 111 frames. Yelich becomes the third excellent outfielder (joining Giancarlo Stanton and Marcell Ozuna) to depart Miami this winter. The organization has loaded up on interesting young talent and drastically reduced its payroll commitments, but may well not yet be done with the dealmaking. Several higher-priced veterans could still be moved and top remaining assets like J.T. Realmuto, Dan Straily, and Justin Bour could still be discussed in trade talks. Ken Rosenthal of The Athletic reported the deal (via Twitter). Jon Heyman of Fan Rag reported the inclusion of Brinson and Diaz (via Twitter).